The father of seven had implored Americans in his final Facebook post to vote. The post became widely shared online and received more attention Tuesday as his widow talked about Taylor’s service in Afghanistan that coincided with recent parliamentary elections there. Her comments were televised nationally on the same day that millions of Americans turned out to vote. 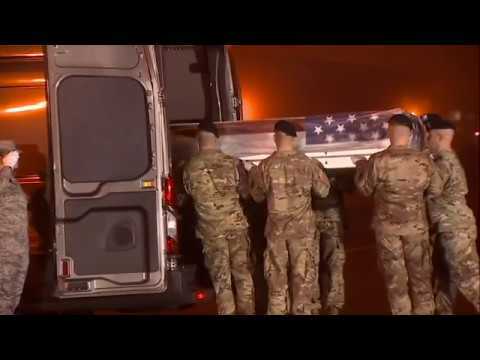 “It seems only fitting that Brent, who in death now represents so much greater than any of our own individual lives, has come home to U.S. soil in a flag-draped casket on our Election Day,” Jennie Taylor told reporters after Brent Taylor’s flag-draped coffin arrived at Dover Air force Base in Delaware. “Brent may have died on Afghan soil but he died for the success of freedom and democracy in both our countries,” she added. Taylor’s post , drawing a connection between democracy abroad and at home, has been seen and shared thousands of times. “It was beautiful to see over four million Afghan men and women brave threats and deadly attacks to vote in Afghanistan’s first parliamentary elections in eight years. The strong turnout, despite the attacks and challenges, was a success for the long- suffering people of Afghanistan and for the cause of human freedom,” he wrote. Taylor had become mayor in 2013, and had a local hero’s farewell when he was being deployed last January. Hundreds of residents of North Ogden, about 40 miles (65 kilometers) north of Salt Lake City, lined the street to see him off as police escorted him and his family around the community of about 17,000.